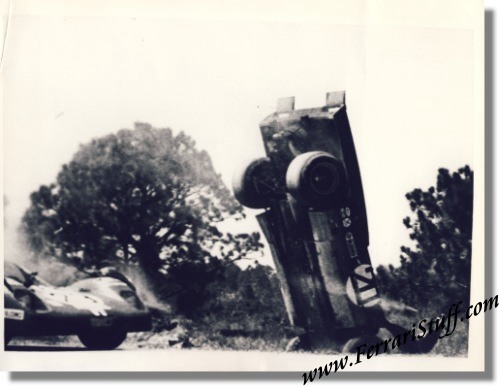 Vintage 1971 Wire Photograph of Ferrari 512 M S/N 1014 crashing at Sebring 12 Hours. This is a vintage 1971 photo of Greg Young's 512M at the moment of its crash during the 1971 12 Hours of Sebring. Young hit a sand embankment at the hairpin turn in lap 29 of the race. The car was rebuilt after the accident but without a roof panel. Young continued to race the car but again crashed it at the Fuji Grand Prix in 1971 after which it was written off but it somehow seems to survive and resides in a Swiss collection. The photo measures some 23 x 18 cm or 9 x 7 inches. It is in very good condition for its age and carries the World Press International Photo stamp on the back and a seperate paper leaf with caption.